Editor's Note: This three part series examines the roots of Shotokan karate through Gichin Funakoshi's 15 original kata. The first article discussed the controversy over Funakoshi's classification of Okinawan karate's Shorin and Shorei traditions by body type, as well as his knowledge of kata. The second and third articles focus on in-depth discussions of the meaning and origin of Funakoshi's core kata. Meaning 13, some people refer to this kata as 13 hands, 13 fists, or 13 steps. Customarily taught in both Tomari and Naha (towns on Okinawa), this kata, following the tradition of Chotoku Kyan, is the first kata the Isshinryu karate student learns. A move from Seisan is here demonstrated by Funakoshi in his 1935 book. It is unclear exactly what the number 13 represents. Some think it was the number of techniques in the original kata; some think it represents 13 different types of "power" or "energy" found in the kata; some think it represents the number of different application principles; some think it represents defending against 13 specific attacks; and some think that it is the number if imaginary opponents one faces while performing the kata. Out of all these theories, this author must disagree with the last, as it is highly unrealistic that kata teaches one to handle such situations. On the contrary, kata was designed to teach the principles needed to survive more common self-defense situations, rather than a long, drawn out battle against several opponents (Iwai, 1992). Akio Kinjo, the noted Okinawan karate researcher and teacher who has traveled to China, Hong Kong and Taiwan well over 100 times to train and research the roots of Okinawan martial arts, maintains that this kata originally had 13 techniques, but due to a long process of evolution, more techniques were added to it (Kinjo, 1999). He also maintains that the Okinawan Seisan kata derives from Yong Chun White Crane boxing from Fujian Province in Southern China. It is unsure who brought this kata to Okinawa, but we do know that in 1867, Seisho Aragaki (1840-1920), a master of the Chinese-based fighting traditions (Toudi) demonstrated this kata (among others) in front of the last Sappushi (Chinese Imperial envoys), Xin Zhao (Tomoyori, 1992; McCarthy, 1995, 1999). The main lineages that include Seisan include those passed down from Kosaku Matsumora /Kodatsu Iha /Chojo Oshiro, Chotoku Kyan, Seisho Aragaki, Kanryo Higaonna, Kanbun Uechi, and Norisato Nakaima, among others. Shimabuku learned this kata from Kyan. Both the Kyan and the Shimabuku versions of this kata strongly resemble the "Matsumura no Seisan" used in some sects of Shito-ryu (see Sakagami, 1978). Noted senior Okinawan karate authority Hiroshi Kinjo (b. 1919) states that there is no evidence of a Seisan kata being passed down in the "Shuri" lineages of Sokon Matsumura and Anko Itosu, and that the familiar "Shuri" lineage Seisan versions such as the Hangetsu of Shotokan and the Seisan of Kyan lineage systems, should be referred to as Tomari Seisan. His reasoning is that the so-called Oshiro Seisan as presented in the 1930 "Kenpo Gaisetsu" by Nisaburo Miki and Mizuho Takada was actually passed down from Kosaku Matsumora to Kodatsu Iha to Kinjo's own teacher Chojo Oshiro of Yamaneryu Bojutsu fame. Kinjo believes that Funakoshi, being a school teacher in Tomari (the small port town near Shuri, Okinawa's capital city), may have learned same from Iha, and that as much of Kyan's tutelage seems to have come from Tomari-based masters like Kosaku Matsumora and Kokan Oyadomari, the Kyan version could also likely be traced to Tomari (Kinjo, 2001). This is in direct contrast to many writings on the lineage of Kyan's Seisan (see, for example, Bishop, 1999). The "Master Seisan Theory," which claims that the kata was brought from China to Okinawa by a Chinese martial artist named Seishan (or Seisan), is uncorroborated myth at best, probably propagated by well-meaning, but not-so-well-researched instructors. This legend cannot be found in any of the literature coming out of Okinawa or Japan. This kata is said by many to have been brought to Okinawa by the 1683 Sappushi (Chinese Imperial envoy) Ji Wang (Jpn. Oshu, 1621-1689). It is possible that it is based upon or inspired by techniques that were taught by Ji Wang. A move from this kata is here demonstrated by Funakoshi. The problem with this theory is that why would such a high ranked government official teach his martial arts (assuming he even knew any) to the Okinawans? Also, Ji Wang was only in Okinawa for 6 months(Sakagami, 1978). Ji Wang was originally from Xiuning in Anhui (a geographic section of west central China), and was an official for the Han Lin Yuan, an important government post (Kinjo, 1999). In order to become an official for the Han Lin Yuan, one had to be a high level scholar, and pass several national tests (Kinjo, 1999). Just preparing for such a position would be such a time consuming task that is would all but rule out the practice of martial arts. However, assuming that Ji Wang was familiar with the martial arts, the Quanfa (a generic Chinese term referring to martial arts) of Anhui is classified as Northern boxing, while the techniques of the Okinawan Wansu kata are clearly Southern in nature (Kinjo, 1999). So, was Wanshu named after Ji Wang, or someone else? This is as yet unknown. However, in the Okinawan martial arts, kata named after their originators are not uncommon. Some examples include Kusanku, Chatan Yara no Sai, and Tokumine no Kon. It is entirely possible that this kata was introduced by a Chinese martial artist named Wang (not the offical Ji Wang). As the reader probably already knows, in the Chinese martial arts, it is common to refer to a teacher as Shifu (lit. Teacher-father). Could not the name Wansu be an Okinawan mispronunciation of Shifu Wang (Kinjo, 1999)? Other schools of thought are that Xianhui Wu (Jpn. Go Kenki, 1886-1940) or Daiji Tang (Jpn. To Daiki, 1888-1937), two Chinese martial artists who immigrated to Okinawa in the early part of the 20th Century, may have been responsible for the introduction of the Wansu kata (Gima, et al, 1986). As a side note, Wu was a Whooping Crane boxer and Tang was known for his Tiger boxing. They were both from Fujian. "Those who received instruction from a castaway from Annan in Fuzhou, include: Gusukuma and Kanagusuku (Chinto), Matsumura and Oyadomari (Chinte), Yamasato (Jiin) and Nakasato (Jitte), all of Tomari, who learned the kata separately. The reason being that their teacher was in a hurry to return to his home country." (sic, Shoto, 1914). It is believed by this author that the "Matsumura" in the above excerpt is a misspelling of Kosaku Matsumora, of Tomari. The fact that Kosaku Matsumora is said to have taught Chinto to Chotoku Kyan, is evidence that Matsumora may also have been taught this kata as well (Kinjo, 1999). Now, what exactly is Chinto? There is a form (kata) called Chen Tou in Mandarin Chinese (Jpn. Chinto, lit. Sinking the Head) in Wu Zho Quan (a.k.a. Ngo Cho Kuen, Five Ancestors Fist), which was a style popular in the Quanzhou and Shamen (Amoy) districts of Fujian, or Fukien (Kinjo, 1999), the southern Chinese province facing modern day Taiwan, a popular destination and departure point for both trade and immigration to an from Okinawa before the 20th century. Chen Tou refers to sinking the body and protecting the head. In the Okinawan Chinto kata, this is the first technique, but in the Five Ancestors Fist (style of kung fu) it is the last (Kinjo, 1999). However, that being said, this author has never seen the Chen Tou form to make a comparative analysis. It is, however, worthy of further investigation. There are three distinct "families" of Chinto in modern Okinawan karate: (1) Matsumura/Itosu lineage (performed front to back), (2) Kosaku Matsumora lineage (performed side to side), and (3) the Chotoku Kyan lineage (performed on a 45 degree angle). 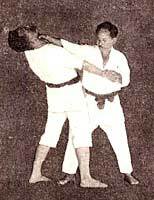 The version practiced by Funakoshi is clearly from the Matsumura/Itosu lineage. There is very little in the way of written materials concerning the last two kata on the list, namely Jitte and Jion. The earliest reference we see to Jitte is in the 1914 article penned by Funakoshi (under his nom de plume Shoto. He here demonstrates a move from this kata in his 1935 book) in the January 17-19 editions of the Ryukyu Shinpo newspaper, where it is mentioned twice. In the section on the "kinds" of karate (i.e. the kata), it is stated that Jitte is a kata that clearly distinguishes the upper, middle and lower levels of technique (Shoto, 1914). As already seen in the Chinto section of this article, Jitte is said to have been taught by a Chinese castaway in the Tomari (the small seaport town nearest Shuri, the capital of Okinawa) region. Chinto is said by many to be related to Jion and Jiin kata (Iwai, 1992, Sakagami, 1978). It is not known where Funakoshi may have learned the kata, but Anko Itosu seems to be the best bet. In fact, Sakagami(the karate historian) states that although Itosu modified many kata to fit his physical education tradition, he seems to have left the Tomari kata of Jitte, Jion and Jiin pretty much alone, thus hinting that Itosu did indeed teach versions of these kata (Sakagami, 1978). Although many of the applications of Jitte in the modern Shotokan world seem to rely upon empty hand defenses against a stave-wielding attacker, some believe that Jitte may actually be descended from a bojutsu kata (Iwai, 1992). Unfortunately, neither can be proved with any satisfying certainty. It is also interesting to note that in the book "Kenpo Gaisetsu," there is a unique interpretation of this kata called Itokazu no Jitte (Miki et al, 1930). Again, Jion is said to have some connection with Jitte and Jiin, but exactly what that connection is, remains unclear and the object of intense curiosity among karate researchers. First presented in Funakoshi's 1922 book "Ryukyu Kenpo Karate," another version of this kata was also included in Nakasone Genwa's 1938 book "Karatedo Taikan," where it was performed by the legendary Chomo Hanashiro (1869-1945), a student of Soken Matsumura and Anko Itosu, who assisted Itosu in his teaching of karate to young people in the Okinwan school system. Tekko were similar to western 'Brass Knuckles." Most often one was held in each hand. In their traditional form (later models were often made of molded brass or aluminum) Tekko had a grip (usually a round piece of wood wound in rope) that was held in the palm of each fist. A rounded studded metal piece then looped from each end of the grip to cover the front of the fist (looking like a hand guard seen on many European swords). They could be quite formidable weapons. But alas, there is also no reliable evidence that these small, concealed weapons of Ryukyu Kobudo were ever codified into formal kata before Shinken Taira (a student Funakoshi and Mabuni in Japan, and Okinawan weapons, or Kobudo under Moden Yabiki. He later formed the Ryukyu Kobudo Hozon Shinkoku) came along. Another more plausible possibility is that Shinken Taira may have been inspired by the Jion kata that he learned from Funakoshi to create a formal kata for the Tekko (Nakamoto, 1983). Jion seems to have been passed down to Funakoshi from Itosu, but if it is indeed a kata passed down in the Tomari area, then it is also possible that Funakoshi picked it up during his time as a school teacher in that district. Jion is also the second standardized kata for JKF competitions from the Shotokan lineage. In Part 1 of this series, the classification, i.e. dividing Shorin-ryu and Shorei-ryu by the body types of the practitioners, can be traced, however, as far back as 1914, when Funakoshi penned an article on karate for the Ryukyu Shinpo newspaper, based on the talks of his main teacher Asato Anko, and writing under his pen name Shoto. In Part 2 in the section on the Pinan kata, In their early, formative years, these kata seem to have been called Channan, but later the name Pinan was adopted by Itosu, apparently upon hearing the opinions of the young students (Kinjo, 1956a; Mabuni et al, 1938; Murakami, 1991; Swift, 2000). For an overview of the Pinan/Channan controversy, see an article on this subject on FightingArts.com: Channan: The "Lost" Kata of Itosu?. A note about Kanku Dai (the modern Shotokan version of the Itosu Kushanku Dai kata) discussed in Part 2 of this series of articles. This kata is one of two standardized Shotokan forms designated by the Japan Karatedo Federation (JKF) for kata competitions. In these articles reference to various Funakoshi books are: (1922) refers to Ryukyu Kenpo Karate, (1925) refers to Rentan Goshin Karatejutsu, and (1935) refers to Karatedo Kyohan. The JKF has designated two kata from each of the "big four Japanese styles" for their kata competitions. They are: Kanku Dai & Jion from Shotokan, Seishan & Chinto from Wadoryu, Bassai Dai & Seienchin from Shitoryu, and Saifa & Seipai from Gojuryu.  Arakaki K. (2000) Okinawa Budo Karate no Gokui. Tokyo: Fukushodo.  Bishop, M. (1999) Okinawan Karate: Teachers, Styles and Secret Techniques, 2nd Edition. Boston: Charles E. Tuttle.  Fujiwara, R. (1990). Kakutogi no Rekishi. Tokyo: Baseball Magazine.  Funakoshi G. (1922) Ryukyu Kenpo Karate. Tokyo: Bukyosha.  Funakoshi G. (1925) Rentan Goshin Karatejutsu. Tokyo: Okura Kobundo.  Funakoshi G. (1935) Karatedo Kyoan. Tokyo: Okura Kobundo.  Funakoshi G. (1956) Karatedo Ichiro. Tokyo: Sangyo Keizai Shinbunsha.  Gima S. and Fujiwara R. (1986) Taidan: Kindai Karatedo no Rekishi wo Kataru. Tokyo: Baseball Magazine.  Hokama T. (1998) Okinawa Karatedo Kobudo no Shinzui. Naha: Naha Shuppansha.  Iwai T. (1992) Koden Ryukyu Karatejutsu. Tokyo: Airyudo.  Kinjo H. (1956) ìPinan no Kenkyu Part 2,î Gekkan Karatedo. 1:3, July-August 1956. Tokyo: Karate Jiho-sha.  Kinjo A. (1999) Karate Den Shinroku. Naha: Okinawa Tosho Center.  Kinjo H. (1991b) Yomigaeru Dento Karate: Kata I. Video Presentation. Tokyo: Quest Ltd.
 Kinjo H. (2001) Personal Interview. Kinjo Residence, Hiratsuka, Japan, 30 June 2001.  Mabuni K. and Nakasone G. (1938) Kobo Kenpo Karatedo Nyumon. Tokyo: Keibunsha.  McCarthy, P. (1999) Ancient Okinawan Martial Arts: Koryu Uchinadi Vol. 2. Boston: C.E. Tuttle.  McCarthy, P. (2001) Funakoshi Gichin & Karatedo Tanpenshu. Brisbane: IRKRS.  Miki N. and Takada M. (1930) Kenpo Gaisetsu. Tokyo: Tokyo Daigaku Kenpo-bu.  Motobu C. (1926) Okinawa Kenpo Karate-jutsu: Kumite-hen. Osaka: Karate Fukyukai.  Motobu C. (1932) Watashi no Karate-jutsu. Tokyo: Toudi Fukyukai.  Murakami K. (1991) Karate no Kokoro to Waza. Tokyo: Shin Jinbutsu Oraisha.  Mutsu M. (1933) Karate Kenpo. Tokyo: Tokyo Imperial University Karate Research Society.  Nakamoto M. (1983) Okinawa Dento Kobudo: Sono Rekishi to Tamashii. Okinawa: Bunbukan.  Nakasone G. (1938) Karatedo Taikan. Tokyo: Tokyo Tosho K.K.  Sakagami R. (1978) Karatedo Kata Taikan. Tokyo: Nichibosha.  Shoto (1914) "Okinawa no Bugi Karate ni Tsuite 1-3." Ryukyu Shinpo, January 17-19, 1914.  Sofue T. (1997) "Bassai no Roots wo Saguruî Gekkan Hiden," July 1999, Tokyo: BAB Japan.  Swift, C. (2001) "Channan: The Lost Kata of Itosu?" Dragon Times Issue #18. This article also appeared on FightingArts.com. Joe Swift, native of New York State (USA), has lived in Japan since 1994. He works as a translator/interpreter, and previously served as an assistant instructor at the Mushinkan Okinawa Karate Kobudo Dojo in Kanazawa. Swift now resides in Tokyo and will be opening a a branch of the Mushinkan Dojo (Okinawa Shoreiryu) in that city. A well know karate historian and researcher, Swift has published articles in the Dragon Times and other leading martial arts journals and on a variety of martial arts sites around the world. He is a Contributing Editor for FightingArts.com.